This post about the Easter weekend sales to shop for 2018 contains affiliate links. Please read this blog’s disclosure post for more info. Happy Easter and Passover everyone! Are you feeling a little extra bunny bounce in your step today? Retailers are hoping you’ll hop right over to their websites and investigate their Easter weekend sales to shop for 2018. I have to admit there are some really good special offers happening this weekend! Meanwhile for work, this cami has been an absolute dream layered under blazers, cardigans and coats. You can see it on me here. During this promotion I plan to pick up several items. To begin, these cute polka dot shorts and these scalloped-hem shorts have been on my radar for awhile. Buying them will hopefully encourage the weather to warm up a bit! Also, I’ve gotten so many recommendations for LOFT’s white jeans that I’ll be picking up the Curvy Skinny Jeans in White (now $35, also in modern cut). The pink Curvy Skinny Crop Jeans (now $35, also in modern) are calling to me too! I might do a monochrome outfit and wear them with this top. I only wish these highly appealing polka dot jeans came in a curvy cut! Unsure how to layer these items? This post will help! What will you pick up during LOFT’s 50% off sale? Better hurry on this one: this lovely suede jacket is selling out fast! Shown with this dress. Another store that’s been very good to me for the Winter to Spring transition is Old Navy. Certainly, this is one of the Easter weekend sales to shop for 2018. This weekend Old Navy is offering items from $7 and 20% off everything else. I’ve raved about Old Navy a lot recently. They’ve done a great job of 1 | reinterpreting pieces I missed out on last year from brands like Madewell. And 2 | their color palette for Spring mixes and matches effortlessly into so many different outfit combinations! I love to mix high and low end and Old Navy has been a big part of that. The item I really recommend you grab this weekend is the Sueded Knit Moto Jacket (now $44), pictured above in ‘Winter Rose.’ I own this jacket in 3 colors myself because of how easy it is to style effortlessly! 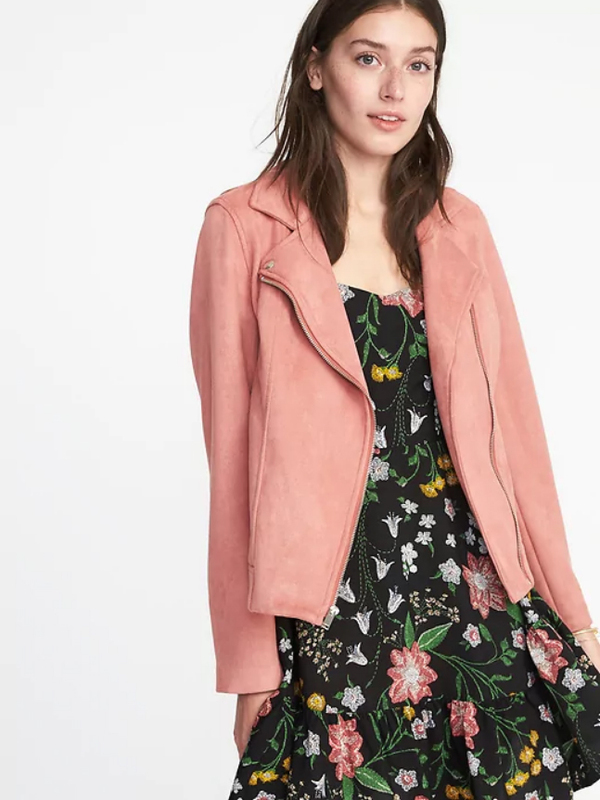 If you love the look of the very popular Blank NYC suede motos but are either afraid the look is too trendy or can’t afford those, this Old Navy jacket is a fantastic option. It’s selling out rapidly so if you like the look I suggest jumping in! It runs a little large in my opinion — I normally wear a large in jackets but purchased this in a medium. I’ll have several OOTDs in this jacket coming up. They’ll initially on my Instagram and then here on the blog! Also I’ll be sharing some mirror selfies of outfits with this jacket on my Facebook page. Several dresses that I really like are included in Old Navy’s Hot Deals section this weekend! All of them come in several beautiful colors and patterns. To begin, the work-ready Sleeveless Tie-Neck Shift Dress is down to $15. It looks great with the Sueded Knit Moto Jacket over it, and also for weekend it looks excellent with the Twill Field Jacket (now $33). I’m wearing my favorite Old Navy dress in this post. Next up, I recommend ordering the tall version of the Fit & Flare Tiered Cami Dress (now $22) and the Fit & Flare Cami Midi Dress (now $29). This will ensure the dresses hit at the right spot on you if you’re above 5’7″ like me. I adore the floral prints on both of these dresses, which have colors that pair so easily with Old Navy’s many cardigans and jackets. The High-Neck Waist-Defined Maxi Dress (now $28) is a very on-trend piece for Spring 2018 at a much more wallet-friendly price. You will find styling ideas for Spring items in this recent post. What items have you bought and loved at Old Navy recently? Finally, Nordstrom Rack is having its Clear the Rack special offer right now, where you can take an extra 25% off clearance items! Promotions like this can be pretty overwhelming — you can shop my full clothing edit here. Items here are available only in limited sizes. Some of my favorites include the Bess Slipdress (now $67) which has a light and airy feel, these perfect athleisure-outfit-making Zella leggings, and a cute hooded military jacket. I’m also looking at a Spring-ready lace-up sweater and a ruffle top that comes in many colors. Over in my shoe edit you’ll find options from Sam Edelman, Stuart Weitzman, Lucky Brand and more. They too are all an extra 25% off. The Marc Fisher Zala Pump (now $90) is one of my top trend shoes for this year and here it is for a great discount! I also see cute booties like the Raft Western Booties (now $48) and the Fileana Split Shaft Bootie (now $60) that would go perfectly with any of the Old Navy dress picks from the section above. Cute slides are also on tap at an extra 25% off. Be sure to also check out my bag edit featuring Kate Spade NY, Sole Society and more. The intimates section is chock full of steals on great brands too! Elsewhere, Express is offering 40% off everything (see all my picks in this post). 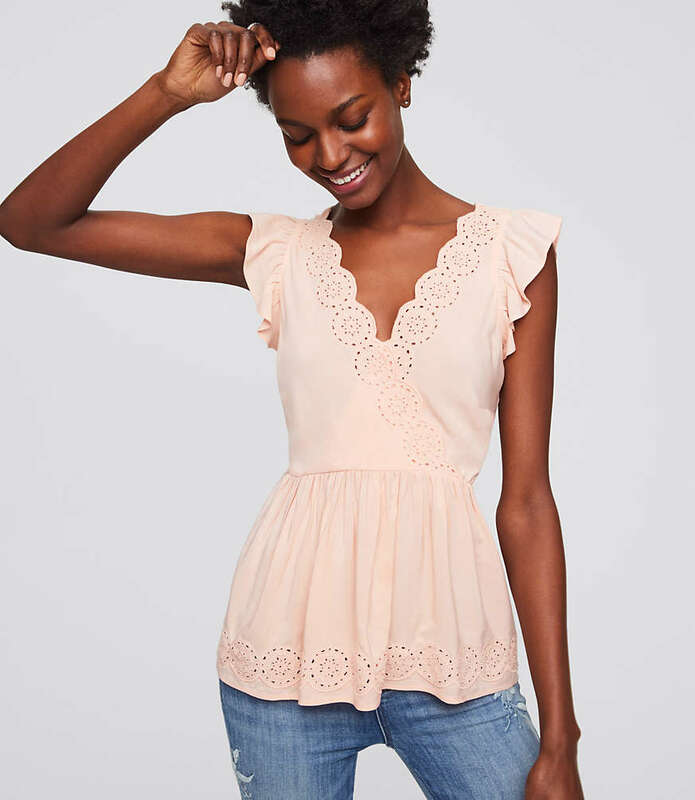 Free People has new sale cuts (my picks here) and Anthropologie is offering an extra 25% off sale (the highlights are here). American Eagle is offering 40% off shorts, tops and swim (get outfit ideas here). What are your Easter weekend sales to shop for 2018? Previous Post Dive in to the Express March 40% off promotion!!! I would note that Easter is a three day weekend in England ("bank holiday") so that may create expectations on the part of retailers just like American three day weekends do. I was pleasantly surprised to find out one of our biggest grocery store chains was closed today. (I knew in advance so I shopped yesterday.). I took a drive this afternoon, just to get out for a while, and saw that Target, TJMaxx, and Marshalls were closed. I was glad to see these stores let their employees spend the holiday with their families. Yes! I agree, it was lovely to see so many stores closed today without fanfare. Kind of off topic, but the new clothes at Anthro are getting weird again. It looked like things were on the up and up to a certain degree, but it seems like it is going off the rails again. I just hate some of these loud prints and colors. Such awkward shapes, too. Yuck. The last round of new arrivals was better for sure.